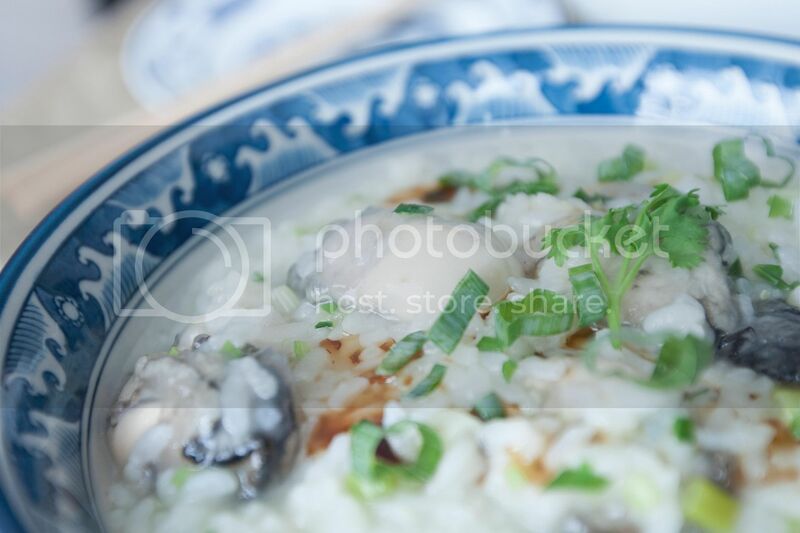 MSG, monosodium glutamate, is one of the common seasonings especially used in Asian cuisine. It acts like an umami enhancer but ingesting a large amount of MSG can cause thirstiness, headaches, and other unpleasant reactions. I've always have doubts in such seasonings, especially any kind of flavor enhancer, more like a short cut, in powder form. Instead, the MSN was replaced by dried ingredients such as mushroom, seaweed, seafood, and cheeses in my kitchen. Bringing out the flavors from some of these natural ingredients might not be as easy as simply dropping a small spoonful or two MSG to the dishes, but the result is rewarding, perhaps healthier too. In the case of shio kombu, which is Japanese salted dried seaweed, all you need to do is adding it to the dish, just as easy as using MSG. Of course I'm sticking with shio kombu and tossing that bag of tiny white particles of MSG away. 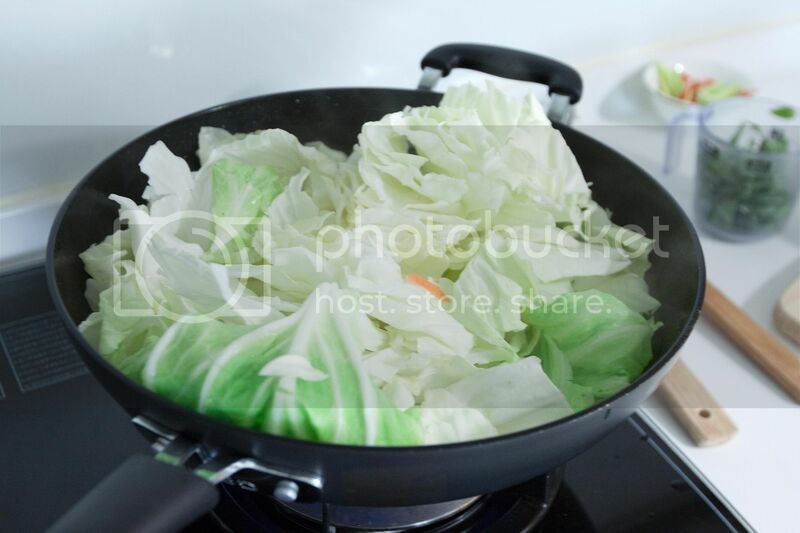 Cut the cabbage into large pieces, trim off or slice the tough center section if needed. Peel and slice the carrot. Trim off the mushroom stems then slice the caps. Peel and slice the garlic cloves. Trim off the chili stems then slice diagonally. Drizzle enough olive oil to evenly coat the bottom of the pan and turn to medium high heat. Add in garlic slices, chilies and salt. Cook till the garlic turns slightly browned but not burnt. Turn to high heat and quickly add in the shiitake mushroom, give it a quick stir to prevent garlic from burning, about one minute. Add in carrot and cabbage. 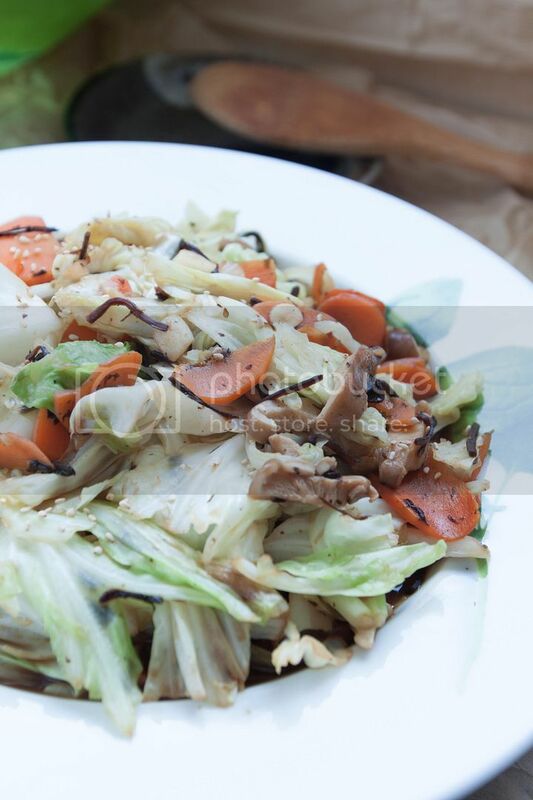 Wait till the cabbage wilts and the size reduces by half, add in shio kombu. Keep stir-frying all the ingredients. 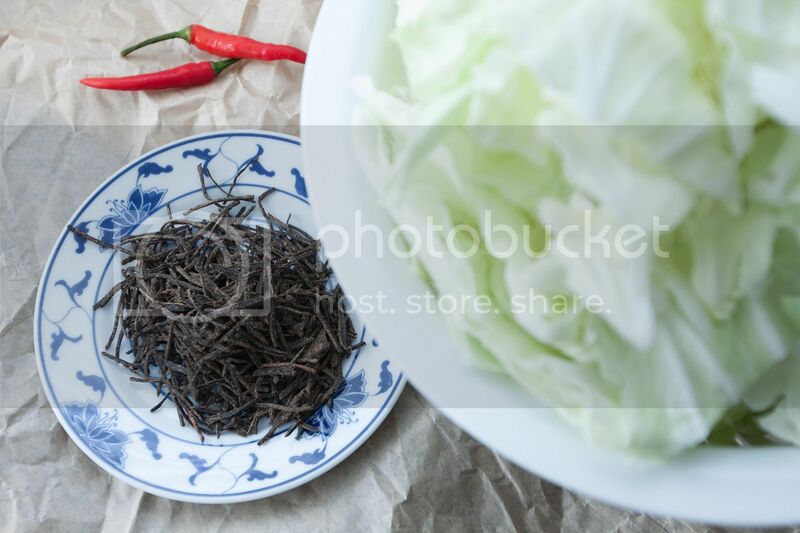 Every shio kombu comes in different saltiness level, so it's better to taste the stir-fry and adjust with salt once the cabbage reaches desired texture. So what other non-dried natural ingredients can be used to substitute MSG or high in umami? Try flavorful mushrooms, cheese rinds, shellfish, and yeast products. Cream of mushroom and chicken soup are probably two of the most common western canned ingredients in my kitchen. By itself, cream of mushroom can be bland. However, with additional ingredients and seasonings, cream of mushroom actually serves as a more flavorful binding agent compared to heavy whipping cream. 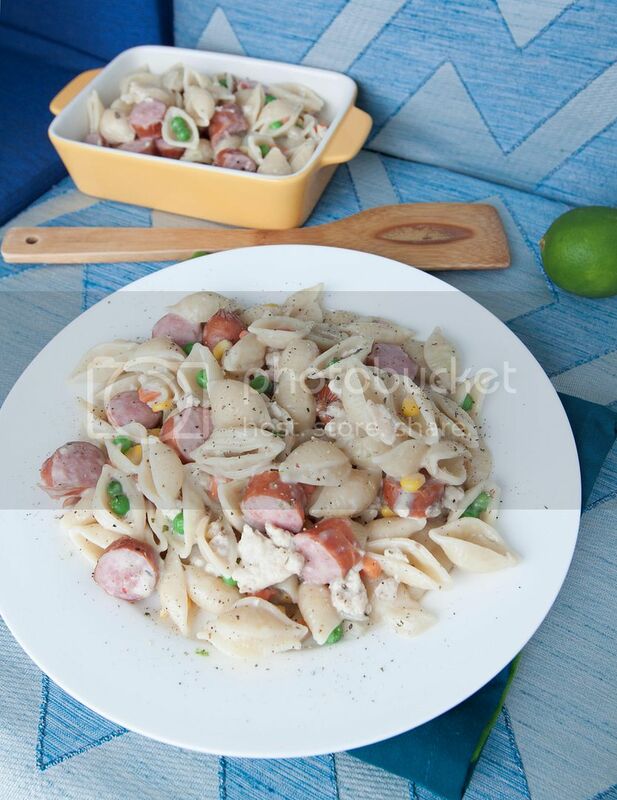 This recipe calls for tofette pasta, a type of medium sized shell shaped pasta. You can substitute with other similar sized varieties such as macaroni, casarecce, farfalle, and fusilli. Peel and cube the onion. 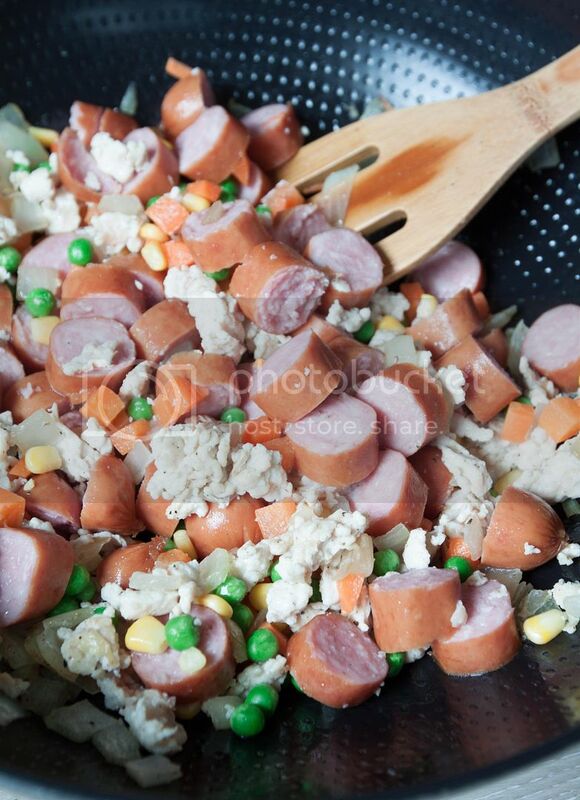 Cut the sausages into smaller bite size pieces. Zest one lemon, you can even save some freshly squeezed lemon juice if a more sourish taste is preferred. Bring a big pot of water to a boil and well seasoned with few pinches of salt. Add in the pasta and cook till al dente, drain well and set aside for later use. Drizzle enough olive oil to evenly coat the bottom of a big pan or a nonstick pot. Add in chopped onion along with some salt and freshly ground pepper. Give it a quick stir and cool till the edges of the onion turned browned but not burnt, add in ground chicken. Stir and separate the ground chicken with spatula into smaller piece. 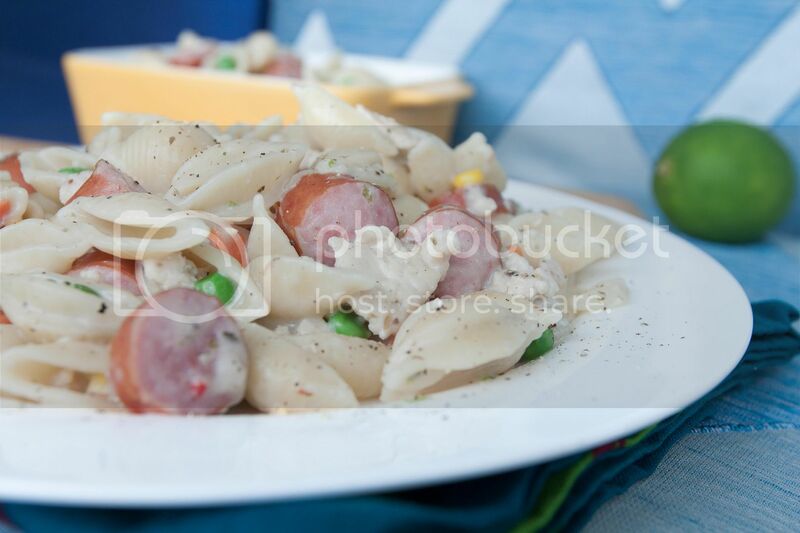 Once about half way cooked through, add in smoked sausages, frozen vegetable cubes, and dried Italian seasoning. Cook for one minute. Pour in cream of mushroom and lemon zest, maybe juice of 1/2 lemon if preferred. 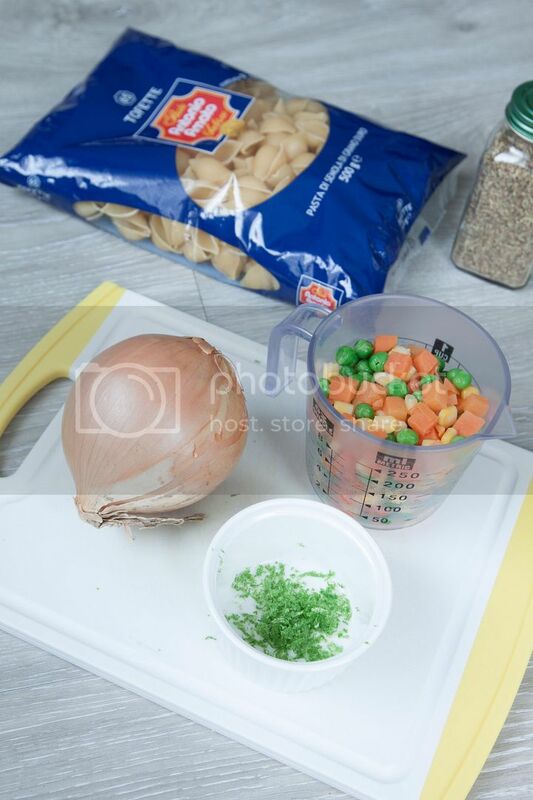 Mix and cook for another minute or two, add in the tofette pasta. Mix and make sure every pasta is well coated with the sauce. Sprinkle some more freshly ground pepper and serve with Tabasco on the side. Little note here, try to stick with heavier tasting sausages to balance off lighter flavored chicken and cream of mushroom. Having wisdom tooth removed as an grown up adult is not fun at all. It was my last standing wisdom tooth. My dentist suggested to get rid of it while I'm "still young." "Wait till you're pregnant or too old to handle such surgery" my scary dentist said. It wasn't just pull-and-go kind of wisdom tooth. In fact, the stubborn tooth has a root shaped like a Nike logo, which made me suffered for 40 whole minutes before this sucker left my mouth. Swollen for the following week of course, and tempting to wide open my mouth was out of the question. What else can I eat besides smoothie, juice, or soup? 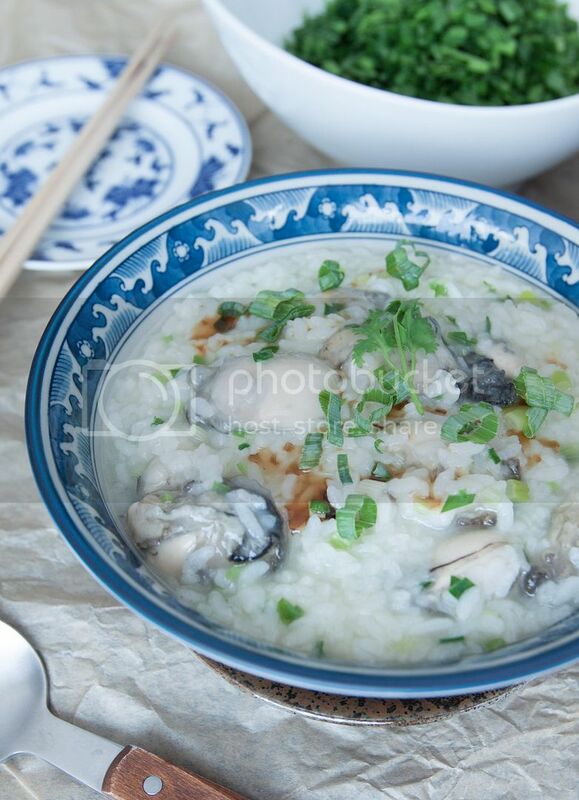 Porridge then, and I demanded for fresh succulent oysters, lots of it. Might as well make the suffering a little bit tastier. Gently rinse and pat dry the oysters with kitchen towel. 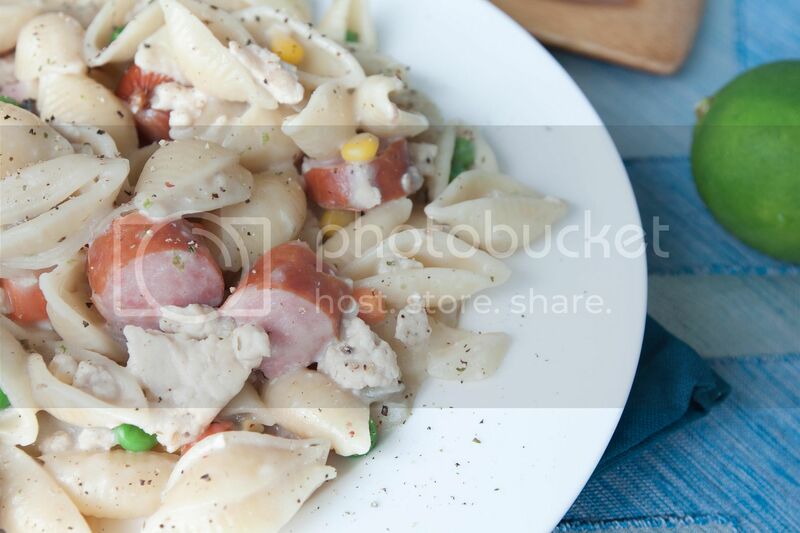 Pour some corn starch to a bowl or plate and bring a small pot of water to a boil on the side. Coat the oysters with corn starch and shake off excess powder. 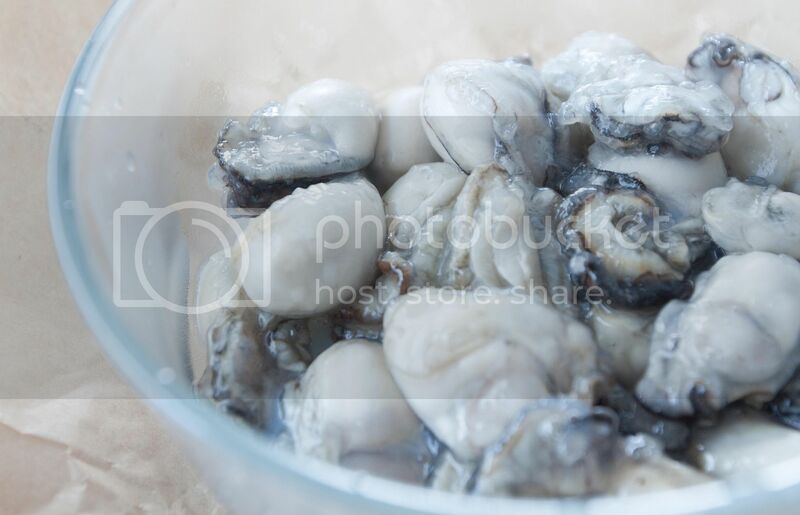 Quickly transfer the coated oysters to the boiling water one by one then turn off the heat right away. Drain well and set aside for later use. You can also rinse the oysters with cold water to stop the cooking immediately but I omitted this step and the oysters did not shrink and still remained succulent. Grate the ginger. Trim off the scallion stem and chop the remaining. 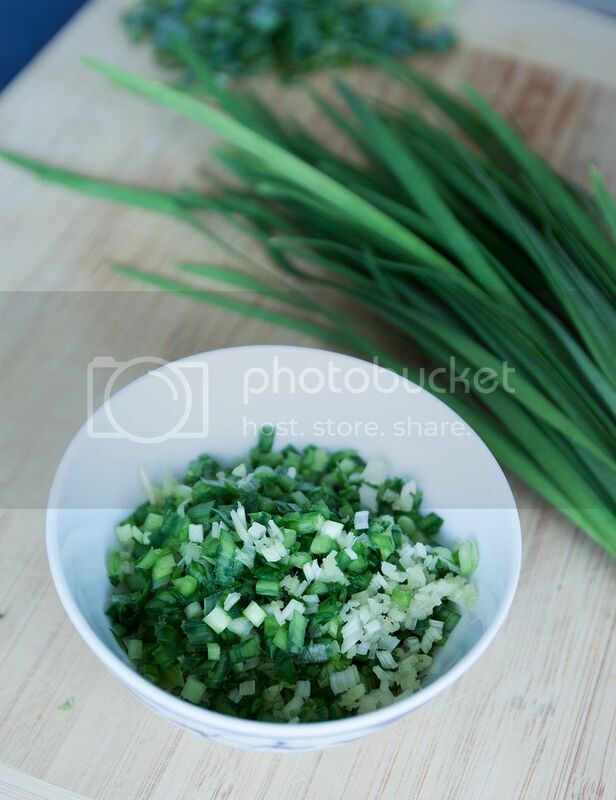 Finely chop the Chinese chives and celery, the skinny kind of Chinese celery preferred. 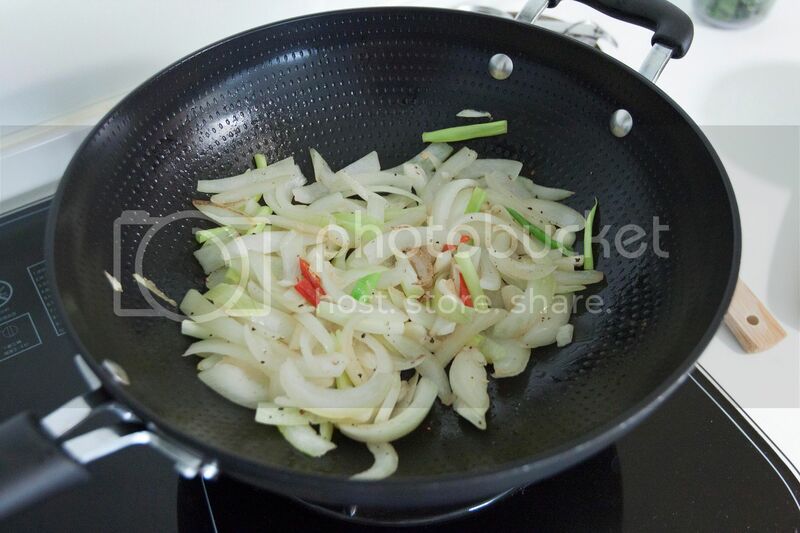 Drizzle some olive oil to a big pot, add in the white part of the chopped scallion along with 1/4 teaspoon of salt. Cook till the aroma comes out but not burning the scallion. Pour in the stock, water, grated ginger, chopped Chinese chives, and chopped celery. Bring to a boil then lower the heat to keep it at a simmer. Sprinkle some white pepper powder, about two good splashes, also taste and see if more salt is needed. Cook for couple more minutes. Add in cooked rice and keep simmering till it reaches desired texture. Add more stock or water for a more gooey texture. Add in the oysters then turn off the heat right away, gently mix in the oysters together with all other ingredients in the pot. Scoop to a serving bowl and top with green part of the chopped scallion and some cilantro. Add a few dashes of sesame oil for extra aroma. Coat the oysters with corn starch is very important here. 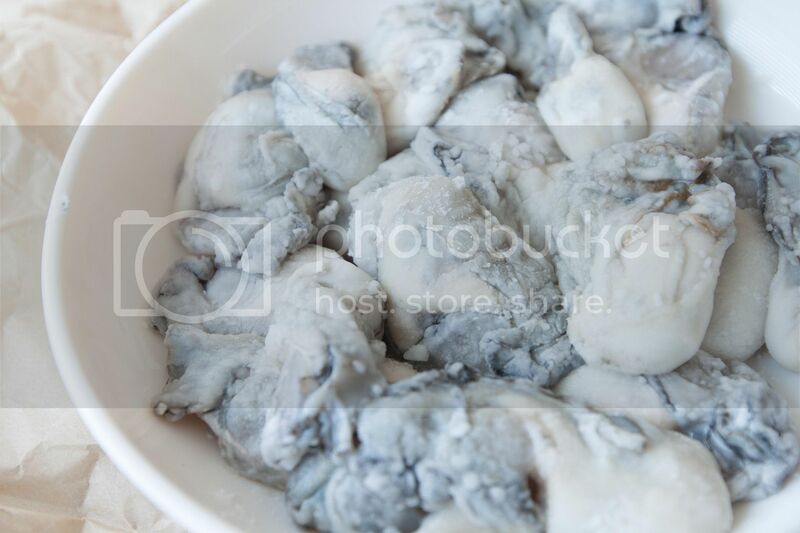 Without that gooey layer of protection, the oysters can lost its moisture during the cooking process and you'll wind up with small and sad looking oysters instead of these fatty ones shown in the pictures. So long my wisdom tooth, after all these suffering, at least I don't have to worry about the possibilities of you being decayed or having my gum swollen anymore. If you ever come across marbled beef slices, especially thick cut beef slices, just grab it and store in the freezer if not using right away. 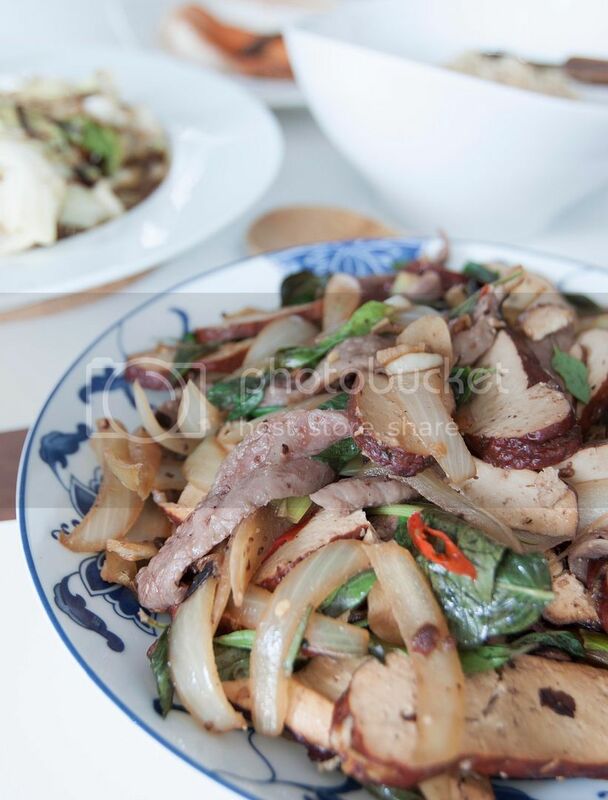 This part of the meat tends to be tender and doesn't turn tough even after extended period of cooking. There's no need to "tenderize" the meat by pounding or marinating, its natural marbled fat content takes care of all the hassles. Peel and slice the onion. Peel and roughly chop the garlic cloves. Trim off the chili stems and chop diagonally. 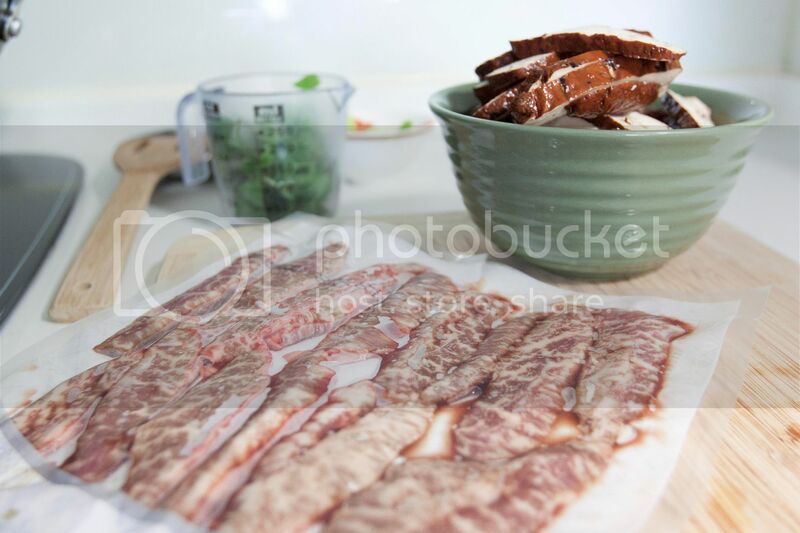 Trim off the scallion stem and cut in few strips. Pick out the Chinese basil leaves and leave the tougher stems aside. Slice the bean curd squares. I prefer to quickly dip the store bought bean curd squares in boiling water for few seconds before use, kind of a cleaning habit, but it's totally up to you. Drizzle enough olive oil to evenly coat the bottom of the pan and turn to medium high heat. Add in onion slices along with salt and pepper. Cook till the edges turned slightly browned, add in garlic, chilies, and scallion. Give it a quick mix and cook for another 30 seconds. Add in bean curd slices and give it a quick stir. Pour in the soy sauce along the edge of the pan so the direct contact of heat can further bring out the soy sauce aroma. Also add the sugar and salted black beans to the mixture. Cook for about 10 seconds then add in thick cut beef slices. Quality steak slices work just as well but it does come with a hefty price. 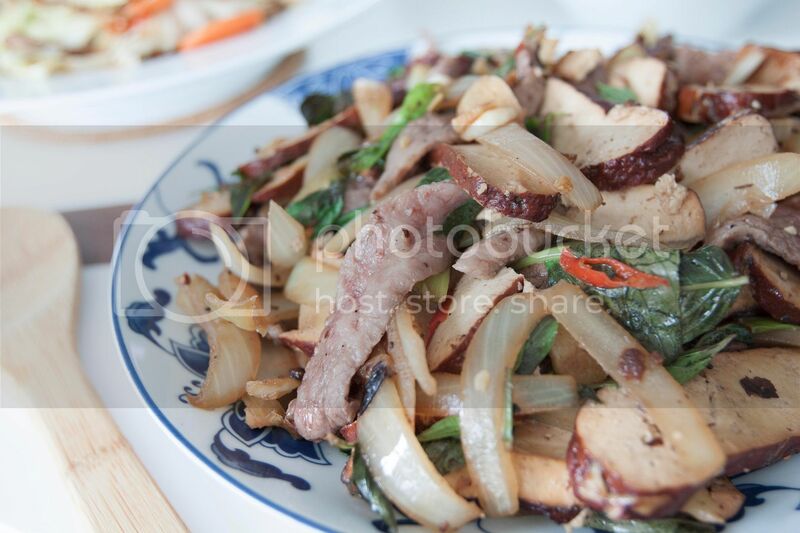 Wait till the beef slices are about 80% cooked through then add the Chinese basil leaves. Give it a quick stir then turn off the heat, this should be done in just a few seconds. Garnish with additional fresh Chinese basil leaves if desired. 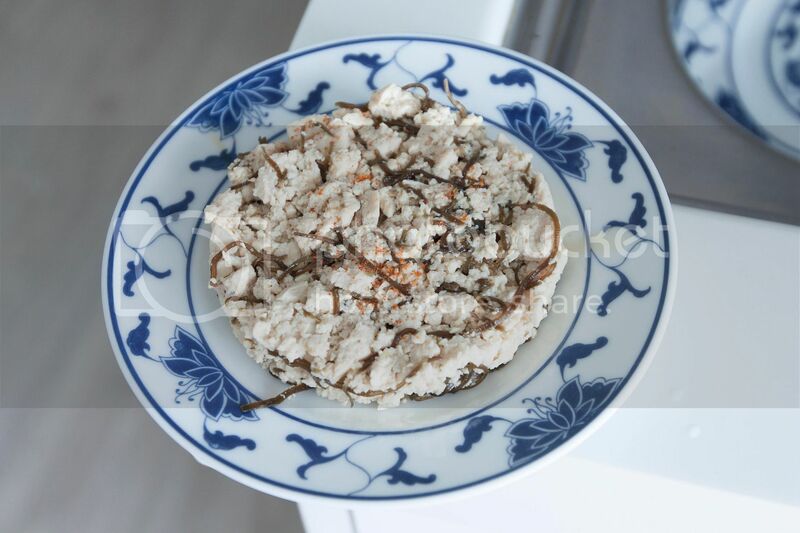 Salty, spicy, aromatic, I love to serve it as a side dish for steamed rice, but this along can also be a good match with beer. 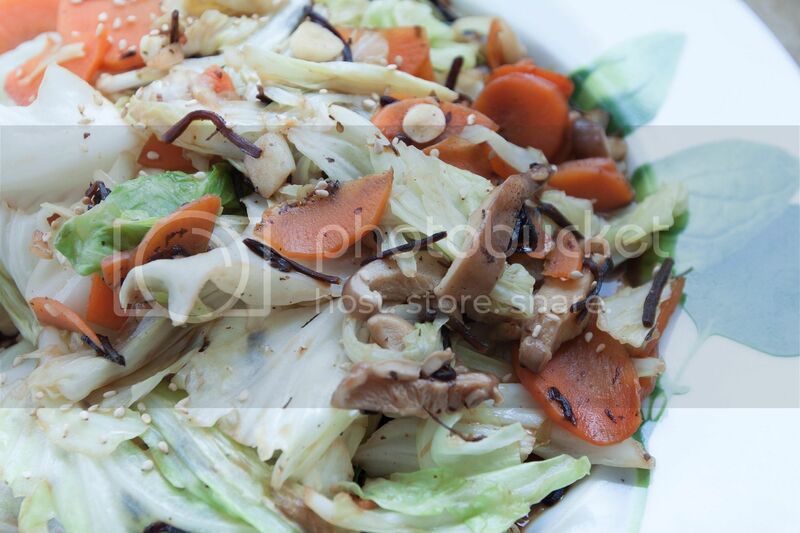 Trying to get back to work is always tough after a relaxing long weekend, so I thought this no fuss cooking recipe should be a great helper when trying to fix up a healthy side dish under a time crunch. No stove fire involved and easy cleaning afterwards, this tofu recipe can also store in the fridge for few days and serve immediately without warming up. Remove the tofu from the package and drain well. Transfer onto a plate and steam for 10 minutes. Once ready, drain well again and wait till the tofu cools enough to be handle by hand, or at least till no more steaming heat presents. Break the tofu into smaller bits by hand or with a fork. Mix in dried shio kombu and blend well. 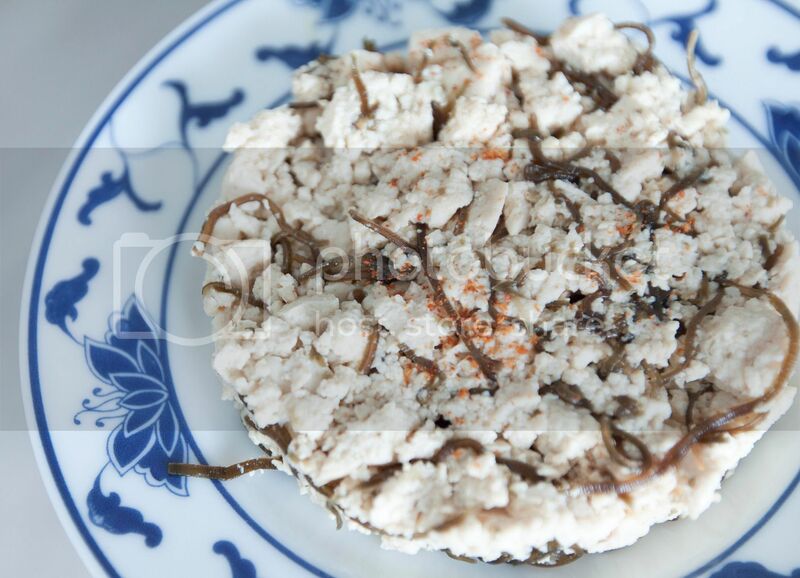 The remaining moisture inside the tofu should soften the shio kombu and further release its flavors. 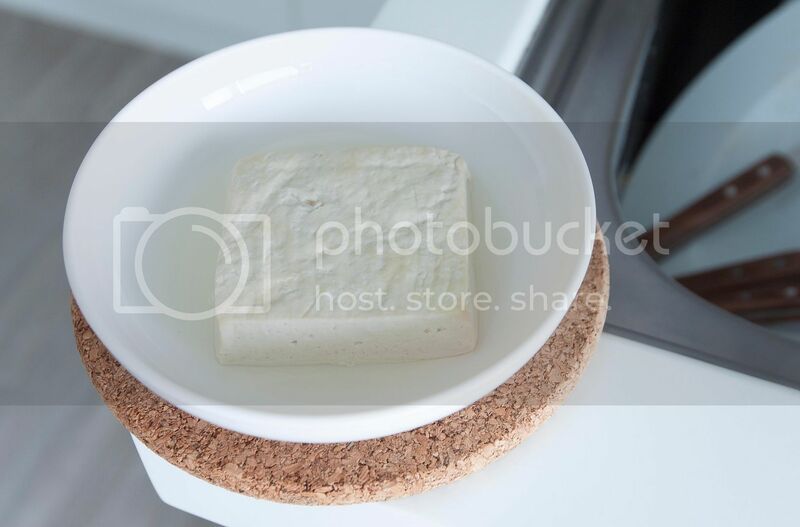 Put a ring mold on the serving plate and fill in the tofu mixture. Press with gentle pressure to better hold the shape then remove the ring mold. This molding step is not necessary. Drizzle some sesame oil and sprinkle with chili powder before serving.